Princes William and Harry were cheered by fans as they arrived for the Royal world premiere of the 22nd James Bond film, Quantum of Solace. The Princes met 200 invited servicemen, veterans and their families on the red carpet in London's Leicester Square. 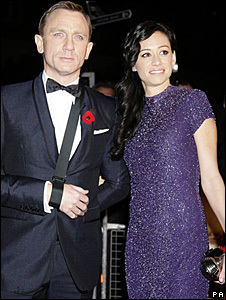 Actor Daniel Craig arrived with his arm in a sling, before signing autographs for fans and posing for pictures. Proceeds from the event will help support two charities, the Royal British Legion and Help The Heroes. When asked why it was important the film was launched in London, Daniel Craig said: "Because it's Bond - it's as British as it could be." Leicester Square was transformed with giant screens and speakers belting out Bond themes old and new. Speaking on the red carpet with his long-time partner Satsuki Mitchell, Craig said he could never get used to the "incredible" reception he received from the screaming fans and was "very happy" with the film. "This is a great, exciting, action-packed Bond movie with a lot of emotion and good feeling in it," he told the BBC News website. He also revealed that he learnt some Spanish whilst filming in South America but could not give a demonstration as he did not want to embarrass himself. Dame Judi Dench, who plays Bond's boss M, was the first big star to walk the red carpet, revealing to the cameras a 007 stuck in glitter on the back of her neck. She said she hoped the next Bond film would see the return of regular characters Q and Miss Moneypenny. "It would be lovely, but you never know until the script arrives - you never know if you're going to be in it until the script arrives," she said. New Bond girl Olga Kurylenko arrived on the red carpet wearing a dramatic red dress and said the evening was "very exciting and overwhelming" for her. Gemma Arterton chose a revealing purple dress and told the BBC News website she still could not believe she was in a Bond film, or at a Royal premiere. "I can't get my head round it, I feel like I've gone into some weird sleep - it's fantastic," she said. 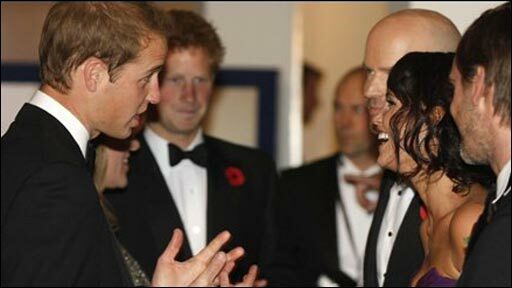 "I never thought I'd meet royalty so I've got to scrub up and be on my best behaviour." Jack White, who wrote and co-performed the latest Bond song, Another Way to Die, was also among the stars who attended the event. He said he felt "immense pressure" to deliver a good theme song. "Leading up to 30 or 40 years of songs that are so powerful and classic, it's hard to know what direction to go to except being powerful," he said. Bond producers Barbara Broccoli and Michael G Wilson, as well as director Marc Forster, also arrived to be greeted by an excited crowd. "There was an incredible amount of pressure on me to create this film because the last one was so successful and the expectation was so high, but I'm really pleased with the movie," Forster said. Wilson added: "It's a big challenge to come back and do as well, if not surpass Casino Royale, but Daniel is better than ever so we have high hopes." Quantum of Solace picks up where the previous Bond film, Casino Royale, left off - making it the first sequel in the 40-year-old franchise. The film sees the British superspy, who has been betrayed by his girlfriend, Vesper Lynd, crossing Europe and South America as he fights to find out the truth behind her actions. Along the way, the secret agent falls foul both of his enemy and British and US intelligence as his mission becomes intensely personal. Named after a short story by Ian Fleming, Quantum Of Solace is said to have cost $230m (£141m) to make. But it is widely expected to eclipse the success of 2006's Casino Royale, which took $594m (£364m) at the global box office. The film goes on general release in the UK on Friday, and in the US on 14 November.